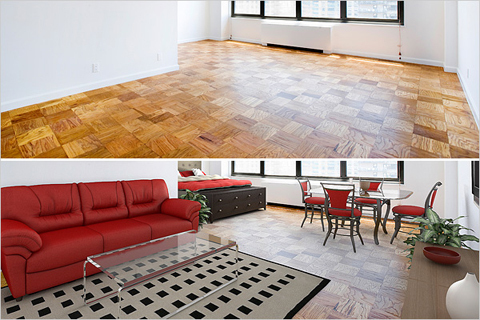 Q: I've heard about using "virtual staging" to market unfurnished homes or rooms. There are a number of software tools that allow you upload a photograph of an empty room and then add computerized images of furnishings, fixtures, and even paint colors. But is this kind of marketing allowed under the Code of Ethics? A: It all comes down to truth in advertising. Article 12 of the Code requires that REALTORS® "be honest and truthful in their real estate communications and...present a true picture in their advertising, marketing, and other representations." Although virtual staging is a new development in the marketing arena, it has been technologically feasible to alter pictures for many years - and even before that it was possible to take a photo in a misleading way. Consider a home that's adjacent to a large, high-powered electric line tower clearly visible from almost any angle. Is there a difference between taking a photo of the home in such a way that the tower isn't visible and removing it from the image using digital editing software? In my mind, either way you'd be presenting a false picture of the home. I think about virtual staging in much the same way. It could be done in a way that's misleading, so you have to be careful. Some may argue that virtual furniture is no different than showing photos of a home when it was actually furnished and is now vacant. But what if the property is in a state of disrepair and virtual staging makes the home appear as if it's been remodeled, rehabbed, repainted, and in move-in condition? In such a case, your images would clearly not be painting a true picture of the property.